Nominated for four awards including Album of the Year, twenty one pilots certainly made an impression at this summer’s inaugural Alternative Press Music Awards when singer Tyler Joseph scaled tall scaffolding in a daredevil stunt. Bands that dabble in so many different genres (the group has alternately been described as rap rock and indietronica) can get lost in the shuffle. This Columbus, Ohio-based is bucking that trend, in part because songs such as the piano-driven hip-hop number “Car Radio” and the poppy “Migraine” are so distinctive. 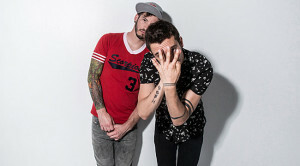 Drummer Josh Dun called in from the tour to discuss the band’s approach. You’ve been on the road all year. Pretty much. The concept of a tour is an interesting thing. We’ve been traveling around for the past two or three years. It’s just a different leg of this ongoing traveling tour that we’ve been doing. But you’ve found time to work on new material. Yeah. Our schedules get busier and busier when we travel a lot, but we’ve been able to upgrade vehicles. Now, we’re in a bus with a studio where we can work on ideas and get things down. We even sat down with a couple of different producers and put some audio to the ones we like. We’re in that stage of nailing down who we want to work with and when this is done, we go to Europe for a little bit. We’ll shut it down near the end of the year and focus on recording the next album, which we’re excited about. We’re in a good place. In no way are we complaining. We love traveling and playing live. It’s our favorite thing to do. It’s just getting to the point where we want to play new music. That performance at the AP Music Awards was pretty impressive. Did you guys rehearse the tower climb or was it a spur of the moment thing? Tyler will surprise me sometimes and climb. It sometimes freaks me out a bit. I sit there and play and silently pray for him. That particular one wasn’t rehearsed. It worked out pretty well. He’s still here and alive. Talk about how you joined the band. I think I met Tyler in 2010. A friend shared a CD of demos with me that Tyler was working on. I listened to it and it was awesome. This friend of mine was playing drums with Tyler at the time. I went to see the show and I loved everything about it except for the fact that I wasn’t on stage. Tyler knew who I was from the band I was playing in at the time. Two days later, we found ourselves hanging out and we stayed up all night talking about our visions and dreams and goals. We wanted to play music together. Logistically, it didn’t work out for another year after that. We built our friendship over that year and I think that was important. When things finally aligned so we could play music together, we were pretty much best friends. It’s been a cool dynamic from the beginning. We both respect each other artistically and in other ways. That’s translated throughout this whole process. What was your vision for the group? Did you consciously set out to mix so many different genres? Personally, I grew up listening to all sorts of different types of music. A lot of people in our generation are the same way. I’ve heard things that try to incorporate those elements and it’s rare that it sounds good. I’m aware of that. There’s a line between two crazy different worlds. One is a very safe side of songwriting and one is very artistic. If you’re too far on either side of those, it’s not going to work. If you’re somewhere close to that line you could have something good. I always wanted to be part of something that incorporates elements of the different types of music I grew up listening to. When Tyler and I got together that first time, that’s something we talked about. That’s what he wanted and was going for too. We live in a generation of kids who have gone from YouTube to Vine. People watch a six-second video and they even get bored with that. People get bored quickly, even us. If it was only up to us and we didn’t care what anyone thought, we’d change styles and tempos a lot more frequently. You can’t get too crazy. I read that Tyler started rapping to fit the words into the songs. Is that true? He started out more writing poetry. He was trying to sing it and it came out like rap. He was self-conscious about it for awhile. His little brother loved it and encouraged him to keep doing it. He finally decided to give it a try and has been doing it ever since. Was the music for “Car Radio” written on piano? Yeah. I think the inspiration for songs can come from different things. It could be a drum or a programmed drum within a computer software or just sitting down at a piano or even a mini piano. Sometimes sitting at a real piano can inspire something totally different. What about “House of Gold.” Was that written on ukulele? I think when Tyler wrote that we were at a friend’s house on our college campus. He just bought it and was trying to figure out how to play it and what the chords were. I didn’t see him for an hour. He said he just wrote a song. It just started with one chord. He ended up finishing it a little later. At that time, I hadn’t heard anything on the radio with a ukulele. It was fun for us to chase that idea of recording a song with a $100 used ukulele. It’s encouraging that the band has had such success without making any compromises. Thanks for saying that. As we go on and get to play shows, seeing that some of these songs are resonating is crazy for us and very encouraging. We’re about to record our second national release and we keep that in mind as we write the new songs.